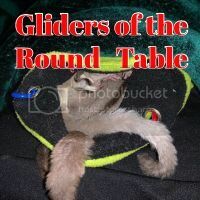 Register Log In GliderCENTRAL Forums Glider Talk and Traveling 12 Hour Cage Breakout! Ok guys this is a story about when my suggie Luna escaped out of her cage at about 1pm. I was giving her yoggies (as always!) and when I was closing the cage door she climbed on it so I opened it. Somehow, she got scared about something (Pretty sure it was a plastic bag) and climbed out and on top of the cage... After a while she was ALL OVER THE LIVING ROOM!!! She then hid in a storage room UNTIL MIDNIGHT! at about 2am my dad called me up because Luna was in a plastic tub covered with a piece of cloth and barking. We put the plastic tub into her bigger cage (She was still living in her small cage at this time) and she suddenly WENT CRAZY AND STARTED JUMPING AROUND IN THE CAGE!! She leaped to the door of the cage and I managed to close it in time.... I still laugh at that day. Mine learned to get over the plastic crunchy noise. Now I'm going through this will our new Joey Stewie. I forgot it can bother or startle them. I'm glad it turned out ok!